Chris Martinez in his lowrider. Photo by Don Usner. When Lowriders, Hoppers and Hot Rods: Car Culture of Northern New Mexico opens in our second-floor Herzstein Gallery on May 1, visitors will get a chance to hear the story of the lowrider lifestyle directly from the practitioners themselves. Photo Curator Daniel Kosharek enlisted the help of 19th– and 20th-Century Southwest Curator Meredith Davidson to interview a host of lowriders from Las Vegas, Chimayó, Española, Santa Fe and Albuquerque. Davidson, who honed her oral-history chops while working for the 9-11 Memorial Museum in New York City, then edited down the results into a 45-minute video loop that will play on iPads placed throughout the exhibit. Interviewees include mechanics, detailers, upholsterers, and classic car owners with names well-known in the lowrider community: Johnnie Martinez, Rob Vanderslice, Robert Eckert, Pam Trujillo and more. “They all love to talk about cars and their processes,” Kosharek said. Thanks to our exhibition, Eppie, who now helps organize lowrider shows, is working with his dad to fix up the Bel Air. 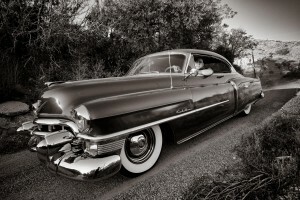 Davidson credited Kosharek and photographer Don Usner, who’s helping curate the exhibit, for ensuring that it welcomes visitors into an exploration of the diverse history of New Mexico lowriders.